The Smart Energy Panel JPC 100-WEB is used for optimum, central display and monitoring of energy measured values. Modbus slave devices (e.g. 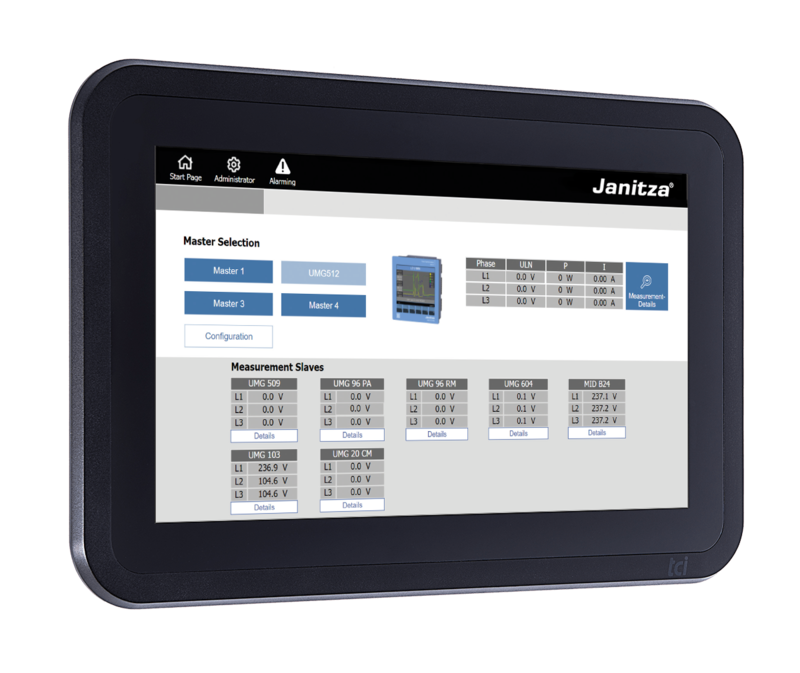 Janitza UMG 103-CBM) are integrated either via the gateway function of the master device or directly via the RS-485 interface. The clear 10-inch touchscreen is characterised by its simple and user-friendly menu navigation. Direct ac- cess to the device homepage, optionally also via remote access, is provided by the web capability of the Smart Energy Panel. Remote access is also possible via Team- Viewer. A USB connection provides for simple export of the measurement data. With the GridVis® software the energy data can be evaluated, documented and further processed. GridVis® offers comprehensive reporting for this purpose. The clear pre- sentation of threshold value exceedances enables hazards to be identified at an early stage. In addition, the e-mail notification function can be activated in the event of viola- tions. Initially defined threshold values for voltage, current and power can be filtered, acknowledged and stored. The storage of minimum and maximum values is also possible. Thank you for your interest in our products. Please do not hesitate to contact us for a consultation to meet your individual needs. We look forward to hearing from you.